I have to confess that I very rarely jumped off the moving train on my own. More often, something (or someone) kicked me from behind. The fall can be that much worse when you’re taken by surprise and don’t have time to figure out the best way to land. Then again, even with forethought, you don’t know what’s ahead. Depending on how fast the train is moving, the soft ditch you were hoping to land in could give way to hard pavement while you’re in midair. In hindsight, you could realize that being booted off the moving train into a ditch was incredibly fortunate. The New Moon in Scorpio on Thursday coincides with a partial solar eclipse. The New Moon typically represents new beginnings, but it can be about endings, too – in particular, the kind that’s necessary before you can move on to something new. Eclipses can come with rapid change – often faster than you’re prepared for. New opportunities could open up or circumstances suddenly change. Any endings are final. The period of influence of eclipses can be anywhere from two to three days to six months or even a year for powerful ones. This week’s eclipse isn’t a particular strong one. It’s partial, and the astrological chart, while indicating some challenges, also contains the potential for positive outcomes to any endings that might occur. That’s not to say it will be easy. It’s never easy to be forced to let go of something. Until the new opportunity comes, it’s difficult, if not impossible, to understand and accept the loss, and hanging in midair without a safety net is scary. I almost don’t want to tell you all of this. As much as we don’t want to be afraid, there is something magical about breaking through fear and desperation. That’s one of the secrets of transformation and is well-known to alchemists. It’s why the formula for Hollywood films includes the death or near death of the hero before he returns victorious. Death and transformation. How very Scorpio. Of course, it’s exaggerated in the movies. Not many people are going to battle the Dark Lord and be struck down lifeless, only to suddenly wake up and vanquish the source of all evil. For most of us, our battles are more mundane. Nonetheless, we battle our own demons, and life can be a constant struggle between the forces of darkness and light. Of all the signs, Scorpio best represents that struggle. For many, the conflict takes place within the context of a love relationship. Jealousy, possessiveness, obsession, all-consuming lust, vengefulness, and even violence – “crimes of passion” – are the negative traits of Scorpio and the ones that are hardest to overcome. Over the years, many clients have come to me wanting to know why they are so obsessed with a love interest. Some were hoping I’d say it was because the object of their desire was their destined soul mate (rarely the case), but many wanted to know how to “get over it.” Obsession is uncomfortable and disturbing. Few people choose it, and yet it can’t be overcome simply by telling yourself you’re not going to obsess. My response is that it can’t be overcome, and it is a gift. It’s precisely this feeling of being out of control – whether in a love relationship or other circumstances – that creates the right conditions for transcendence and personal transformation. Less than an hour before Thursday’s New Moon, Venus enters Scorpio, putting the Sun, Moon, and Venus all at 0 degrees Scorpio. Venus is the planet of love and relationships, so I expect that many of the new beginnings and endings that occur around this eclipse will involve intimate relationships. Relationships can take on a life of their own. They go through trials and challenges just as individuals do, and those difficulties can transform them, just as it does with a person. Alternatively, finances may be subject to change, as Venus also is associated with money. Again, which is more likely for you depends on where this eclipse falls in your natal chart. The Sun and Venus don’t make an exact conjunction until Saturday, which is the day Mercury returns direct in relationship-oriented Libra, which is ruled by Venus. These combined transits make Saturday a strong day for eclipse-related events, be they in our personal lives or in world affairs. Mercury, meanwhile, stations opposite Uranus, the planet of sudden changes and surprises, which has been in a tense square with Pluto. In world affairs, the Uranus-Pluto square has manifested as popular uprisings with brutal crackdowns by increasingly militarized police. The old system is crumbling, making way for something new and as-yet unforeseen. Individually, our ways of thinking and living are being challenged, but our egos are struggling to maintain the current order. If your life is in chaos, or if you feel rudderless and confused, it’s all part of the same pattern that’s occurring worldwide. Mercury returns direct at 3:17 EDT on Saturday, in a close sextile with Jupiter, planet of abundance, in open-hearted Leo. This is a good time to tell those you love how much they mean to you or, better still, show it. Even if you’re in the middle of a fight or otherwise unhappy with each other, stop long enough to realize that life is messy, and love isn’t always patient, kind, and without envy. That’s a nice goal to aspire to, something to work on every day, but just because you aren’t perfect at it, doesn’t mean it isn’t love. Same goes for your partner. The Mercury-Jupiter sextile is exact on Monday. Earlier on Monday, Venus and Mars form a supportive sextile. Whereas Venus represents the divine feminine, Mars represents the divine masculine; thus they are sometimes referred to as the cosmic lovers. There’s a lot of symbolism in this happy connection between the two, just as both are about to enter new signs, with Venus conjoining the Sun and Moon at an eclipse. Lessons have been learned. The curtain comes down on the final performance, and practice begins for the new play. It’s also interesting that Venus enters a sign co-ruled by Mars and in which she’s not at her best, while Mars on Sunday (October 26) enters Capricorn, in which he is very strong. But she is strengthened by Mercury in Libra, suggesting that difficulties can be addressed through good communications. Note, I didn’t say “easy” communications. Some subjects are hard to talk about, and it can be easier to keep the peace by remaining silent. That won’t work now, as it’s too easy for resentment to build up and sabotage all the effort you’ve made to forge a stronger bond. Despite all the shifting this week and potential for opening and closing doors, I don’t think it will be as turbulent as we’ve seen recently or in March and April. Any changes are likely to be the next step in circumstances that have been ongoing. But then, one step is all that lies between the speeding train and the ditch. I’ve jumped off so many speeding trains, but it doesn’t get easier. When it’s your path to keep moving through “stuff,” rather than staying still like so many people do (until they’re pushed & total catastrophe erupts), it’s just that way. I prefer some control to my chaos!! Well, I’ll take the illusion of it anyway. Great essay on this week’s aspects. Thxs. I hope this is a good one… It lands very near my 2nd house cusp, and with Venus entering my second house the day before I’m hoping for some good news on the earned income front. Gretchen, this is a tricky one, because Saturn also is in Scorpio, so he likely is in your second house as well, although at the end, depending on the degree of your third-house cusp. During the years when Saturn is in the second house, money can be tight, not necessarily due to a drop in earned income (although that’s often the case) but also to large expenses. Of course, this is a vast oversimplification, as your individual experience depends on whether Saturn is aspecting other planets in your chart. The same is true for the eclipse. But, in general, Venus conjunct a New Moon in your second house is tentatively positive. I’m a bit confused, as I don’t read charts. 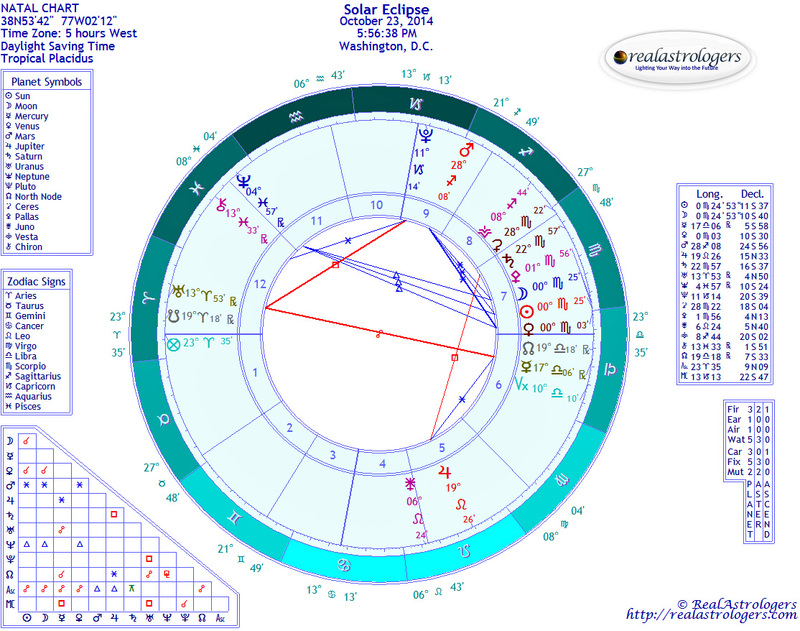 Are the Mercury-Jupiter and Venus-Mars sextiles happening today (Monday 10/20/2014) or next Monday, the 27th? Thank you in advance, and for the wonderful guidance your weekly forecasts provide. Steve, I write about aspects in the week immediately ahead, starting on Monday. However, if I refer to an aspect on Sunday, I include the date to avoid confusion, since the forecast comes out on a Sunday (I’m trying very hard to get back to posting on Saturday). Occasionally I refer to an aspect in the following week, but I always include the date. So to answer your question, the Mercury-Jupiter sextile is today at 4:38 p.m. EDT. The Venus-Jupiter sextile occurred early this morning, at 1:18 a.m. EDT — which of course means that it was late Sunday on the West Coast of the U.S. Sorry if that creates more confusion. I agree with other commenters. It’s a good post and as usual, reflects something of what I am going through with love, obsession, and transformation. I get clients who describe confusion over the mysterious goings-on, meltdowns and oddities going on with them, and I try to convey (without “astro-lingo”) that everyone’s going through a transformative time in some way, that they’re not going crazy, that it will eventually pass, etc. I always hope what I say falls on receptive ground and eases some fear and pain. Ironically, I may never know as sometimes I never see these people again!